For years, Nick’s had a reputation in Rhode Island as one of the best restaurant spots to get a fantastic breakfast. That’s still true, but eventually Nick’s opened their doors to patrons seeking dinner and provided a completely different, yet still stellar, dining experience. I’d enjoyed a few Nick’s On Broadway breakfasts in my time, but I never seemed to make it over for dinner. That was my loss and my wife sought to remedy that as soon as possible by making us a reservation. The interior of Nick’s is split into two rooms. 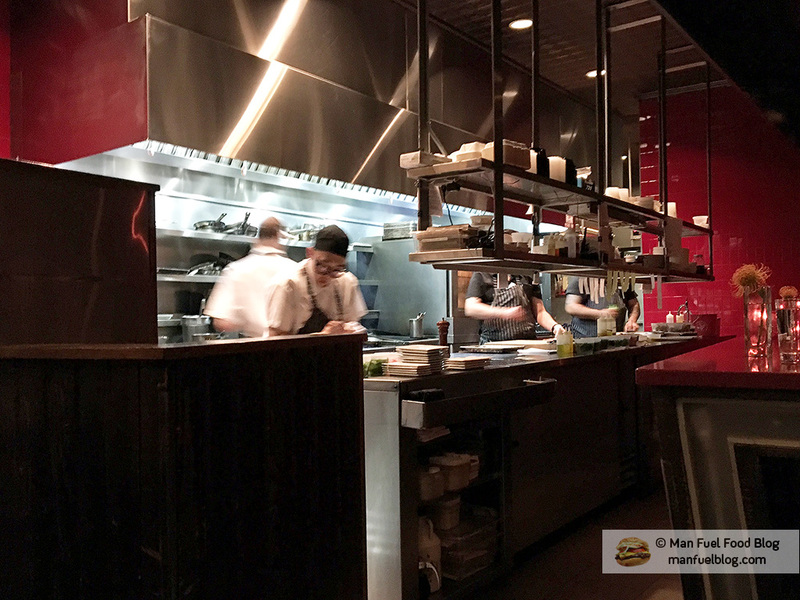 The entrance area has the bar with some small table seating while the other side has counter service, the open kitchen, and some larger tables. This dinner was my first opportunity to sit on the kitchen side as I’d always sat at the high-top tables for breakfast. The hosts and servers were all extremely friendly and accommodating. The pacing of the meal was very nice because it wasn’t too fast or too slow and our server kept in mind that we didn’t have time to linger for a long drawn out meal so that we could get back to relieve the babysitter. 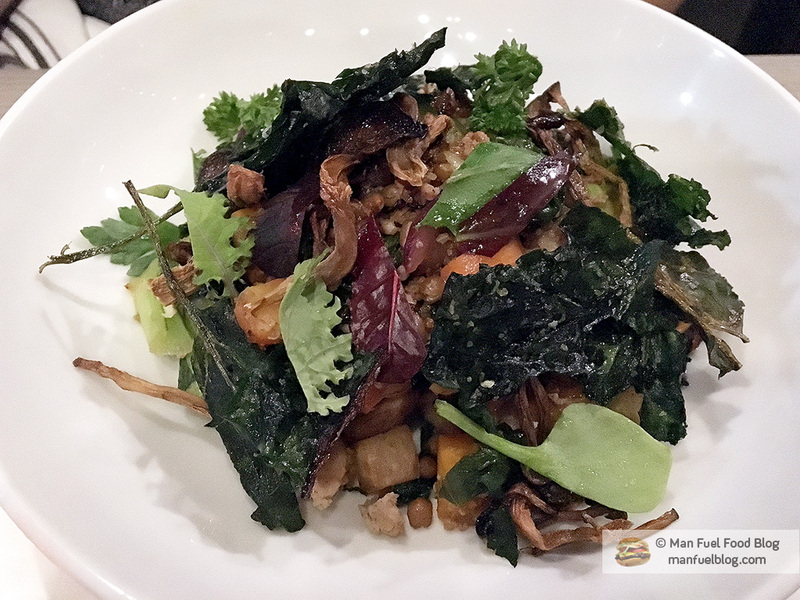 Our server informed us about the intriguing tasting menu options, but also let us know that they are better suited for people with the time for a very leisurely meal. We appreciated the candor and respect for our time concerns. The only hiccup of the evening occurred when we ordered a dessert. It took about 35 minutes for the tiny dessert to come out. 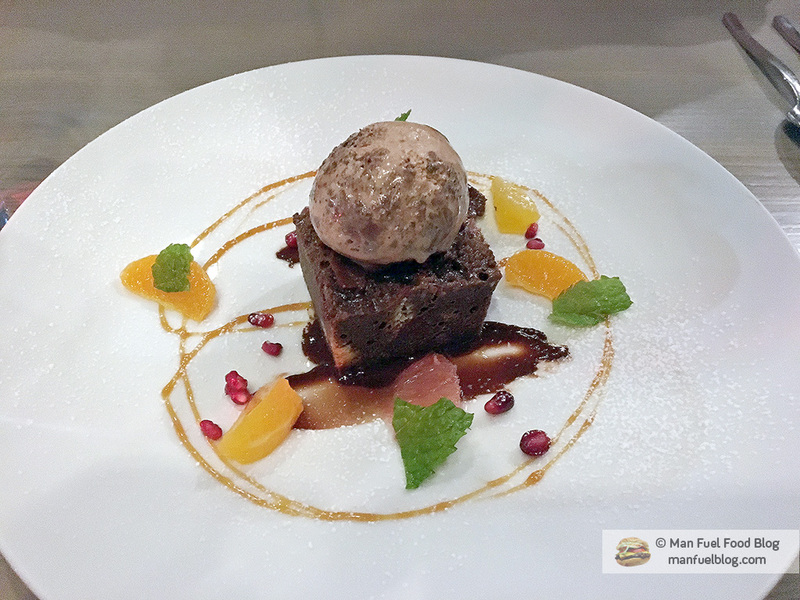 This seems like it may have been a fluke in the kitchen, but it would have been nice to get some warning that the dessert dish might take a lot of time. Our server was apologetic, but had we known, we probably would have opted not to get anything for dessert. 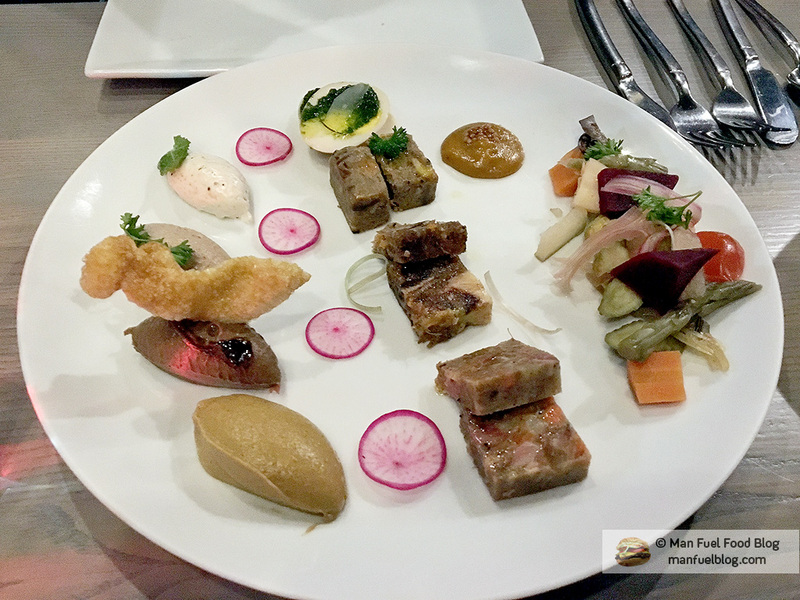 Practically everything we ate at Nick’s was delicious and stunningly presented. Even the simple items came out and fed the eyes as well as our bellies. Cocktails – Standard Mule – We ordered a Standard Mule cocktail for me (a Moscow Mule using Russian Standard Vodka) and some wine for my wife. 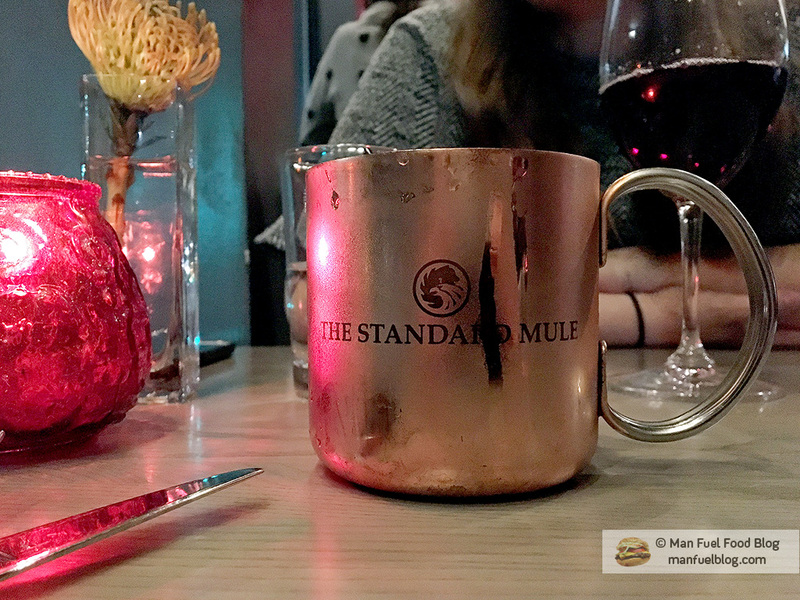 We were off to a great start with a very nice red wine and a very well balanced Standard Mule served in a copper cup as one should. Beet Hummus – This simple dish of beet infused hummus came out arranged with a variety of colored root vegetables on top of the hummus. The toasted bread that accompanied it had just the right balance of butter and crispiness to act as the perfect vehicle to carry the hummus to our waiting taste buds. The earthy, sweet beets paired brilliantly with the sesame tahini paste and chickpeas. Charcuterie Plate – This. This is my reason to come to Nick’s for dinner. I could have just eaten more of this plate and considered it a perfect meal. I loved every single variation of pork, chicken, beef, and lamb. 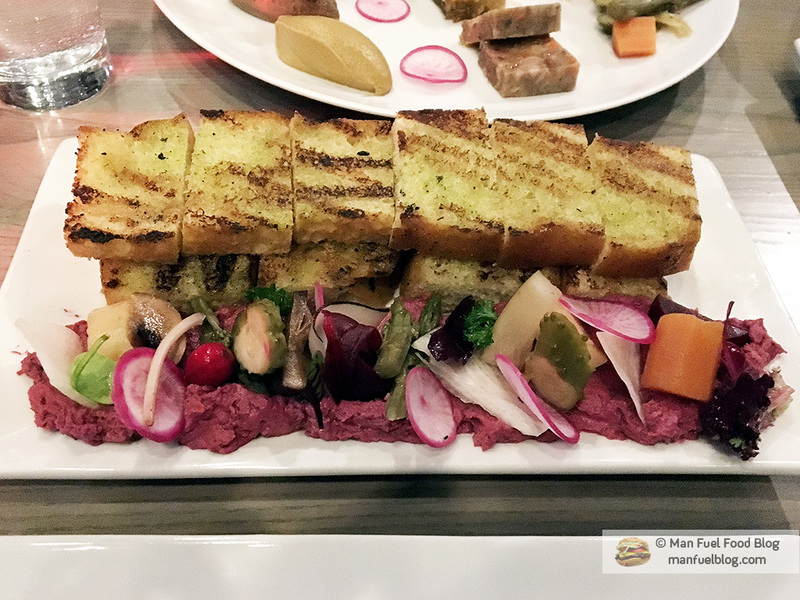 The plate had a cider pork terrine, chicken liver pate, beef liver and kidney pate, pork pate, lardo with spices, lamb terrine, and a beef terrine. I cannot sing the plate’s praises enough. Each locally sourced protein was transformed into a dazzling combination of meat and spices that shined to highlight specific flavors. Don’t pass on Nick’s charcuterie board. 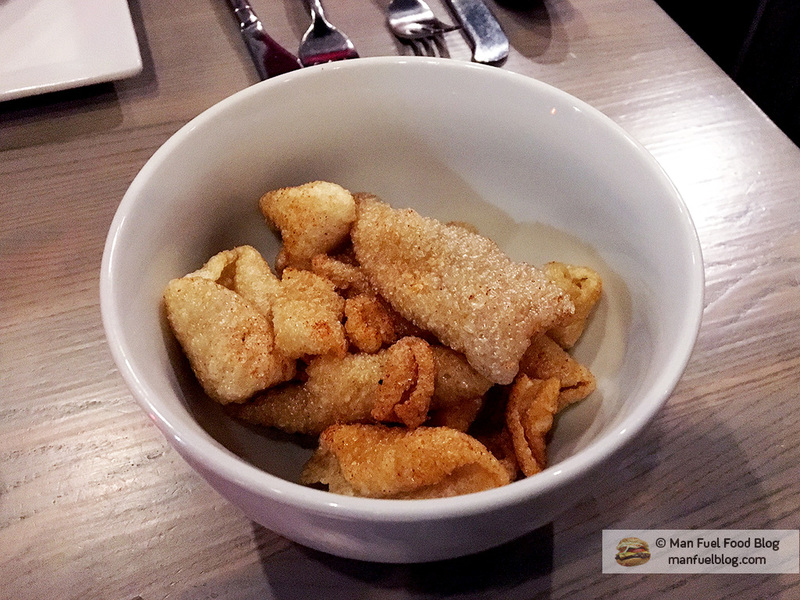 Chicharrones – While I thought that Nick’s did a great job of executing these chicharrones, they weren’t really what I was expecting. Rather than the classic pork rind style one can find in many grocery store aisles, I was hoping for the Colombian kind that has crispy skin, fat, and meat still attached. Nonetheless, it was a decent dish and would go great with a beer, but just not my preferred chicharron preparation. Chicken (Salad?) – My wife ordered what she thought was a chicken dish, but turned out to be some kind of salad with very little chicken in it. The flavors were nice between the fresh dressed greens and nuts, but it wasn’t what she expected or wanted. Overall it wasn’t an especially memorable dish other than the fact that the description was very misleading. 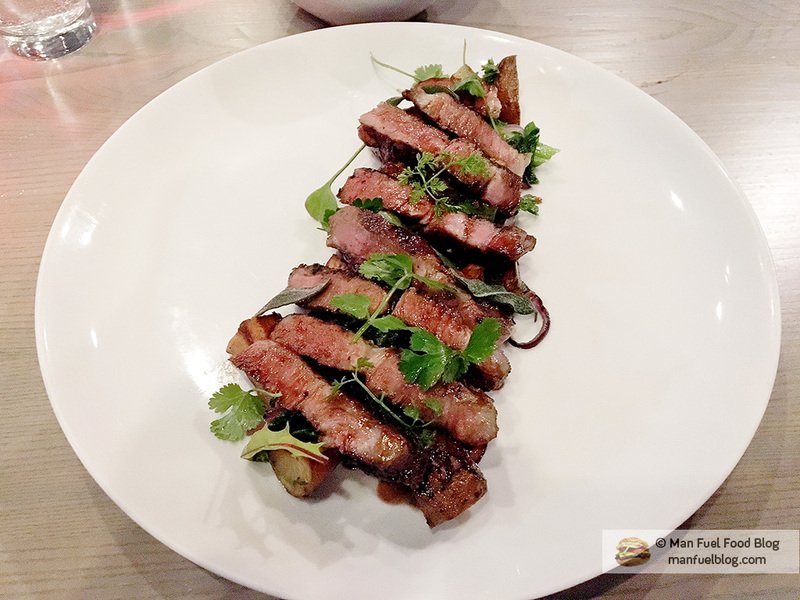 Chargrilled Pork – My entree tasted wonderful. The chargrilled pork was cooked perfectly and was so rich in flavor that it actually tasted a bit like sweet beef. So much so, that I had to make sure I was eating pork, but I mean that in a good way because of the quality of the meat and preparation. Normally, I frown on pre-sliced meat dishes because it usually leaves the meat cold and dry as all the juices leak out. Nick’s let the meat rest perfectly, however, and it wasn’t too cold, but just warm enough not to lose all the juices. Chocolate Bread Pudding – At the end of the meal, we ordered one dessert to share because we were stuffed. The chocolate bread pudding sounded good to us, so we placed our order. This is when the only significant problem with our meal occurred as it took the dessert 35 minutes to come out. By the time 35 minutes had passed, we asked to pay the bill and were just about to cancel the order when the dessert finally came out. While beautifully presented, the dessert unfortunately wasn’t really worth waiting for as it tasted alright, but the bread pudding was more like a fancy brownie with ice cream on top rather than bread pudding. It was a nice dish, but we wouldn’t order it again. Nick’s on Broadway has a great breakfast, but an even better dinner in my opinion. It’s easily one of the best places to enjoy American gourmet cuisine in Rhode Island. Between the stunning plating of each dish and the deliciously masterful preparations of the ingredients, dinner at Nick’s will surely impress. Make a reservation and start the meal with a charcuterie board to do it right!